La Verne dining favorite Chase’s moved into a new, larger location at the corner of Bonita and D Street. Their move to a larger location came with the help of a controversial $79,600 line of credit from the city of La Verne. While some La Verne residents and business owners voiced displeasure at the subsidy, city officials said it was a way of preventing Chase’s from moving to a neighboring city, leaving a vacancy and preserving the tax revenue. The loan comes with an interest rate of 2 percent compounded annually, essentially just high enough to keep up with inflation as the first payment on the loan is not due until March 2019. Chase’s transition has not gone entirely smoothly. Its Yelp page is littered with complaints of slow service and an overloaded, overwhelmed kitchen. There is a lot to be celebrated at Chase’s, although the entire dining experience is not perfect. The wood fired grill on the patio area is a nice touch. It adds dimension to the dining experience. Being able to watch your filet being cooked or your brisket being smoked by a team of pristinely clad chefs (in head to toe crisp white) is unique. It is like a high-brow version of teppan-yaki. The grill and patio were a special aspect of the former location so it is nice to see the upgrade here. 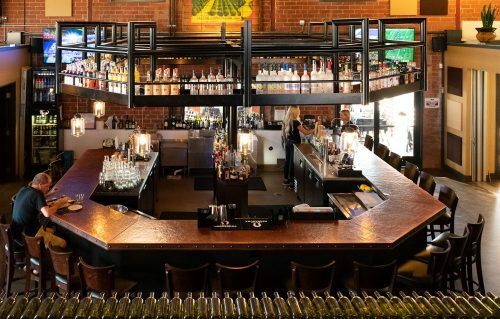 If you happen to go on a busy weekend evening and you face a long wait, Chase’s has softened that blow with the large outdoor waiting area where you can enjoy the ambiance and order drinks from a waitress while waiting to be seated. Ignoring prices for a minute, what Chase’s does well are its meat and fish chef’s specials. Each day is slightly different with varieties of steak and seafood, including prawns, snapper and crab cakes. The specials are meticulously handcrafted by a chef and cannot be modified with substitutions. I respect chefs treating their cuisine as art and insisting all flavors be tasted together. Too often menus are perversely altered by the unadventurous. If you hear a special you like, get it, there is no guarantee it will be available on your next visit. The ambiance is quiet and sophisticated. Chase’s menu and atmosphere makes for a good date spot, but the place does get busy so you may want to be selective about your seating. The inside of the restaurant can get pretty noisy, so I would suggest sitting on the patio where the tables are a little more spaced out and you get a view of D Street, the sunset, and the outdoor wood grill. Their lunch offerings are reasonably priced and do not appear to be any less gourmet, or use any lesser ingredients than dinner. They have different menu options like the wild mushroom grilled cheese, with creamy havarti, arugula, and caramelized onions on sourdough bread. The best part of lunch at Chase’s is that the entree prices top out at a budget friendly $15.75. If you wander in for dinner, fair warning: It is hard to rationalize Chase’s high menu prices and fine dining options with the incessant and unavoidable upcharges on their menu. The ordering experience is a walk through a minefield of additional fees. Who does not enjoy fresh out of the oven rolls and butter while with cocktails before the first course? That’s a dollar per person at the table. You can have as many as you like, one at a time, but do not hold your breath on a second round coming before your entrees. Try the artichoke dip (13.50), it is a melty, cheesy combination served piping hot with naan bread or a baguette. It is delicious and really exemplifies the difference between the thawed out and microwaved artichoke dips served at chain restaurants (cough) TGI Friday’s. It is undeniably tasty, but once your table runs out of the disproportionately small amount of naan bread that accompanies your artichoke dip, do not count on Chase’s to offer you more, instead that will be another $2.50 that appetizer just shot up to $16. The macaroni and cheese ($14.75), delicious with a bacon crust, can include chicken or brisket – for another $5.50, of course. The most flagrant display of nickel and diming is the naked burger. For $14 guests receive a burger on a brioche bun with lettuce, tomatoes and red onions served with truffle fries. Want cheese? That’s an extra $2. If the patty was some wagyu or kobe beef patty, I could reconcile those charges with the overhead. Instead it is “Chase’s special blend,” a title that means absolutely nothing. Pro-tip, when a restaurant is really using quality ingredients, they will name drop like your friend who just finished their internship at CBS. Chase’s sources quality meats and name drops them as such. For all their daily specials, servers have beautifully prepared and rehearsed speeches taking you through the history and the life of the fish and the detailed culinary preparations made on its journey to your plate. So their unknown special blend holds no actual weight. With most entree items in the $20-$30 range, Chase’s is dancing in fine dining territory, at least for an upper-middle class suburb like La Verne. The thing with fine dining establishments is they do not sweat the small stuff the way Chase’s does. Fine dining should not be like ordering a pizza from Domino’s online where every small addition adds a nominal fee. For a business given a gracious subsidy by the city, one would assume some of those savings might be passed onto the customer.